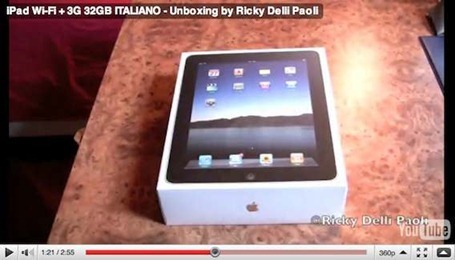 iPads Showing Up Early for Some Lucky Europeans? 9to5Mac is reporting that at least a couple of lucky people – one in the UK, one in Italy – have received their lovely new iPads a few days early. The lucky recipient in Italy has even done an unboxing video. Hey – European readers – have any of you got lucky? "we must not commit the sin of losing our track on time!" – Tom Hanks to the Fed Ex workers, From the movie "Castaway"
Not yet… still waiting ! I ordered the wifi 32go model… I'm swiss ! Can't wait more ! already tons of apps ready to install ! I haven’t received mine yet, but TNT’s tracking site has it out for delivery since 0600 on the 27th (today). Hope they arrive soon for all of you. Oh great – glad to hear it. Loving it? how can i say it…?MAGICAL…it's like holding the whole world in your hand!i love the feeling! I thought i was prepared. Guess what?i wasn't, it's amazingly fast and beautiful. I get the sensation, that for the first time, someone made a device with the final user experience in mind. Jobs said it, it's amazing. Ha. I recognize those feelings! I still feel like that.